Let's start with this: This book absolutely gutted me. I hadn't expected to be quite as captivated by it as I was, honestly, but by the time I was maybe a quarter of the way into the book, I was completely sold. I read around the last half, if not more, of the book in one sitting, curled up in bed, cat sitting on top of me. I spent the last several chapters trying not to cry. It was one of those books. Too bad I hadn’t finished this one for the Best Book Ever: Super Emotional Party Time theme the other week. The Song of Achilles is a retelling of the Iliad, the classic story of the siege of Troy. Miller worked backwards from the first line of the Iliad - Sing, goddess, of the rage of Achilles - and created a marvelous backstory to make his rage on the battlefield at Troy all the more poignant. If you’re familiar at all with your mythology, or even if you only watched that hot mess of a movie Troy several years back, you mostly know what you’re in for, and you know how it ends. That doesn’t stop the book from being spellbinding, and more than a little bit heartbreaking. If you haven't brushed up on your classics in a while, this novel will still work just fine, as it gives you all the backstory you need to understand. 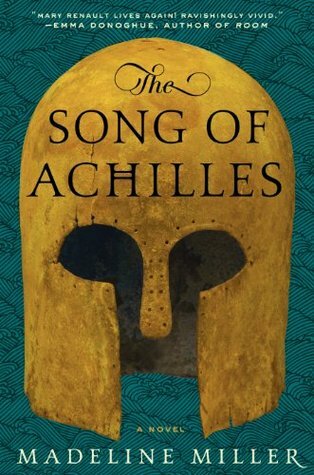 This time around, the story is told from the perspective of Patroclus, dear friend and (as the book, and some historical interpretations, tells it) lover of Achilles. Patroclus is a small boy, not especially strong or fast or good at anything. After he’s exiled from his home due to a tragic but unforgivable accident, he’s taken in by King Peleus, Achilles’ father. While Patroclus initially endeavors to just be left alone, he eventually finds himself befriending Achilles, forming a bond that will last a lifetime, through intervention of the gods, war, and even death. Patroclus is an interesting choice of a narrator. We grow up with him, we see Achilles through his eyes. Patroclus isn't a warrior, but he finds himself going to war, anyway. He's bound to the war just as surely as he's bound to Achilles, and they weather it together. Over the many years of the siege of Troy, we see Patroclus and Achilles grow from boys to men, and while Achilles might be thought of as 'the best of the Greeks', it's Patroclus who can always get through to Achilles, despite his stubborn nature and near god-like status. He's not an unbiased narrator by any means, but his narrative voice feels so authentic and passionate that your heart will ache for him, with all of the trials he must go through. The real highlight here is Miller’s way with words. In all honesty, she has some of the most beautiful prose I’ve ever read. It’s flowery when it needs to be, but it is clean and simple and stark at other times. She plays with verb tenses in a way that’s subtle and almost unnoticeable, but there’s a method to her madness, and it helps the narration pack a punch that you might not even notice at first. If this book sounds like something you'd at all be interested in, pick it up and give it a try! There is a fair amount of violence and some strong language -- this is an epic war after all -- but sexual situations are all handled carefully and aren't explicit (in my opinion).